Assume CA01 has been installed the Certificate Authority. 1. 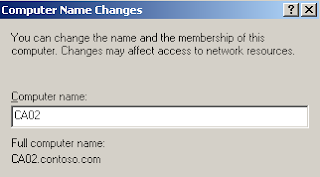 At the CA01 server, logon as Domain Administrator. 2. Click Start > Administrative Tools > Certification Authority. 3. Right-click Domain name, select All Tasks > Back up CA. 4. At welcome screen, click Next. 5. Check Private key and CA certificate and Certificate database and certificate database log. 7. 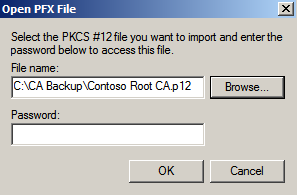 Select C:\CA Backup, click OK. Remark: You need to create the CA backup folder. 9. Provide the password for backup, click Next. 11. Click Start > Run, enter regedit. 13. Right-click Configuration, select Export. 14. Save the registry file in the C:\CA Backup folder. 15. Click Start > Run, enter appwiz.cpl. 16. Click Add/Remove Windows Components. 17. Uncheck Certificate Services, click Next. 19. Click Start > Run, enter sysdm.cpl. 20. Select Computer Name tab, click Change. 21. Under Computer name, type CA02. 24. 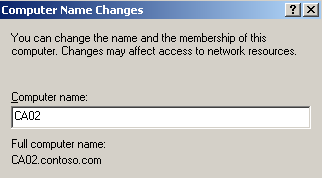 At Windows Server 2008 R2 server, logon as Local Administrator. 25. Click Start, enter sysdm.cpl. 26. Select Computer Name tab, click Change. 27. Under Computer name, type CA01. 28. Next to Member of, select Domain. 29. Under Domain, type contoso.com. 31. After joined domain, restart the computer. 32. 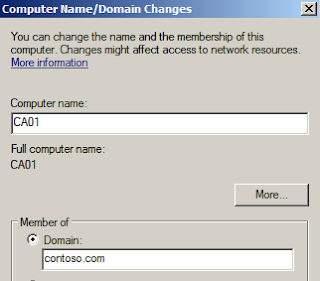 When the restart process is finished, logon as Domain Administrator. 36. Right-click Roles, select Add Roles. 37. At welcome screen, click Next. 38. 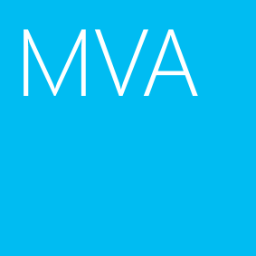 Check Active Directory Certificate Services. 40. Check Certification Authority and certificate Authority Web Enrollment. 41. Click Add Required Role Services. 43. Still select Enterprise, click Next. 44. Select Root CA, click Next. 45. At Set Up Private Key screen, select Use existing private key > Select a certificate and use its associated private key. 49. Select C:\CA Backup\Contoso Root CA.p12. 50. Enter the password for the private key, click OK.
52. Click Next three times. 53. At Select Role Services screen, check Basic Authentication. 57. Click Start, enter certsrv.msc. 58. Right-click Domain name, select All Tasks > Stop Service. 59. Click Start, enter regedit. Remark: If the path that is shown in the registry export from the old CA differs from the new path, you must adjust your registry export accordingly. 62. Launch Windows Explore, navigate to C:\CA Backup. 63. Double-click the registry file to import the setting. 64. 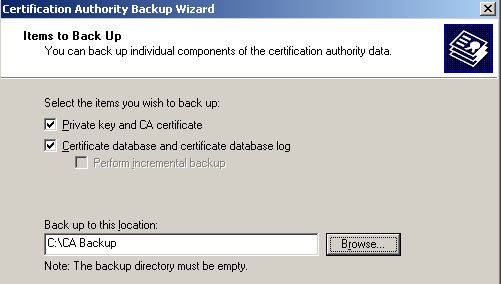 Back to Certification Authority, right-click Domain Name, select All Tasks > Restore CA. 65. At welcome screen, click Next. 66. Check Private key and CA certificate and Certificate database and certificate database log. 68. Select C:\CA Backup, click OK.
70. Enter the password that you exported as before, click Next. 72. Click Yes to start the ADCS service.